A finned tube bent to a specific formation or drawing. A legacy fin tube that hasn’t been produced for decades that needs refabrication from scratch. Good Luck with That — You’re Going to Need It. The raw reality is that few finned tube manufacturers are up for the job. They’d rather stick to what’s already been done, stamped and sealed. But that’s an all-too-static excuse that stands in the way of progress. Because the nature of technology — elemental machinery since the days of the first flint-chipped hand ax — is to make things better. Yet it can be done. You just need to find someone who’s willing — and able — to do it. 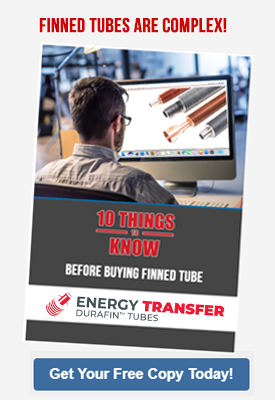 Here’s what a manufacturer needs to deliver custom enhanced fin tube prototypes — and how to tell if they’re up for the task. Being able to produce prototyped fin tube fabrication depends on 3 critical attributes: machinery capability, experienced talent, and engineering know-how to tweak the nuts and bolts. To be clear, the actual design end of the tube is your job. Theirs is to take those blueprints, your raw dreams, and turn them into ripe and rippling reality that works like a charm. Your manufacturer sits down with you and your design and maps out their prototyping capabilities. They plan a custom order based on those capacities. You purchase a prototyped unit, test it out, and then either alter the design or come back and purchase more. You achieve an enhanced surface finned tube that nobody else in the world has made. That’s the birth of innovation — the honing of efficiency, capabilitiy, and need — in a fin tube cylender of pure realized perfection. Once you’ve got the prototype aligned, it’s time to get down to brass tacks. That requires a dedicated production cell — an area in the manufacturer’s machine shop solely dedicated to your project — to churn out accurate replicas of your prototyped finned tube like chocolate chip cookies. This makes the production process much more efficient. All materials and craftsmanship are streamlined in a central location, which controls costs. It also prevents cross-contamination because those machines and materials are used for your finned tubes alone. Pay close attention to the experience, talent, and engineering know-how your manufacturer is able to deliver. That can make or break your project. At Energy Transfer, we’re a legacy business that has been doing this stuff since the ‘80s. Many of our salespeople have been selling this equipment and plotting fabricated builds for over 15 years. They’ve walked that shop floor. They know what can be delivered and what it takes to do so. Onhand, we’ve got R&D engineer Kevin Pasiuk to map out each job; he understands what’s required to make it all sync. Innovation is a daily task on our to-do list. For example, seeing a need, we fabricated the Dura-R1 corrulok tube that’s different than other twisted tape turbulators on the market. It has an internal twisted tape turbulator inside a corrugated tube. We also fabricated the DURA IT — essentially the DURA-R1 corrulock tube with fins on the outside of the tube to further increase the surface area and accelerate heat dissipation. Those are just some examples of the products we’ve dreamed up. We like to prototype opportunity whenever the inspiration knocks. Try us out for custom-size. That’s something we do every day of the week. In fact, we can almost prototype the fin tube of your dreams in our sleep. Will that fin tube supplier be able to deliver? 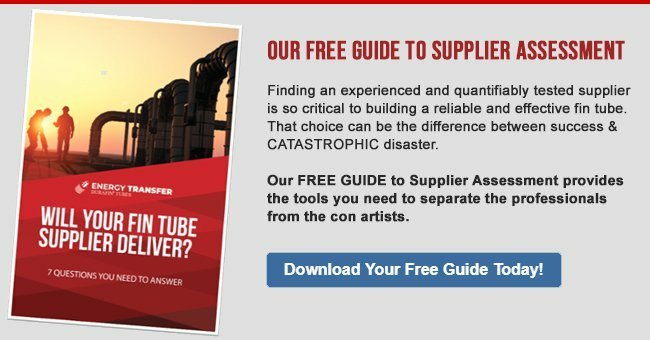 Our FREE HANDY GUIDE provides a critical checklist of what your manufacturer should be bringing to the table. Download YOURS TODAY!